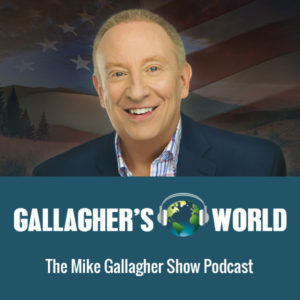 Gallagher’s World is the premium content website for The Mike Gallagher Radio Show. It gives members access to a commercial free version of every hour of the The Mike Gallagher Radio Show. This site – Gallagher’s World – is owned and operated by Mike Gallagher Online. The site is managed by Salem National – a division of Salem Media Group. Salem Media Group also owns and operates radio stations, which broadcast Mike Gallagher’s radio show – The Mike Gallagher Show; Salem Radio Network, which syndicates The Mike Gallagher Show; and Townhall, which provides a variety of Mike Gallagher content at Townhall.com. If you have questions or feedback please submit them here.